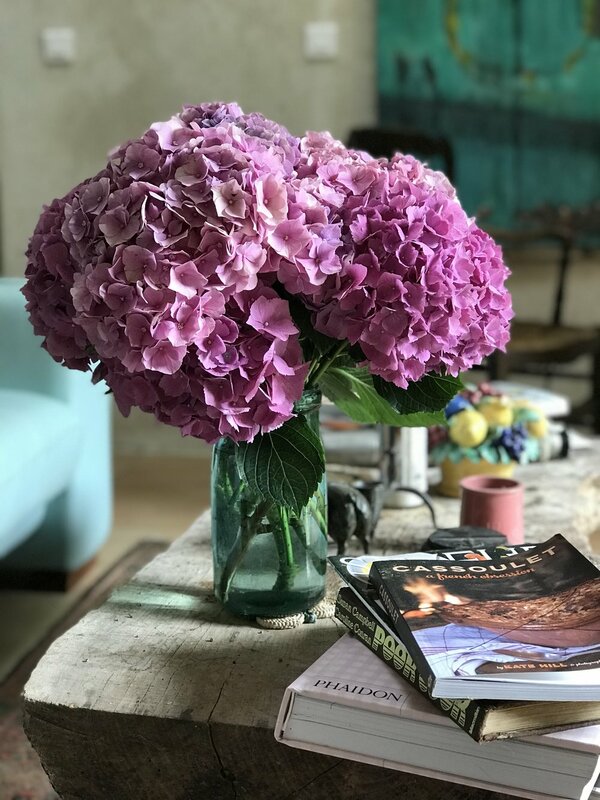 Summer at Camont in the two bedroom/two bath attached guesthouse including Kate’s fabulous 18th-century French kitchen complete with all the antique linens and Not Pottery cassoles and dishes of which you dream. The original part of my French Farmhouse, built in 1724, is now available for summer rental by the week. The three-story Pigeonnier tower shelters 2 large bedrooms, each with a private bath or shower, toilet and sink. 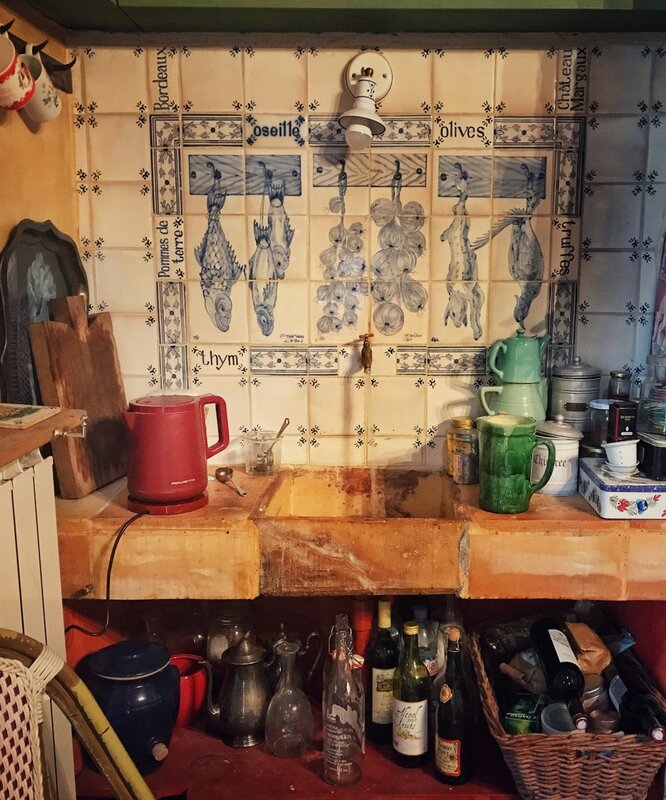 On the ground level is a cool and cozy sitting room and my well-loved kitchen completely equipped for cooking our favorite local Gascon cuisine. The welcoming table on the garden terrace is yours to lunch and dinner on, as well as share the BBQ area and wood-fired oven. All the shady nooks and crannies of our one-acre park complete with pétenque court and hammocks are at your disposal. While attached to the newly-restored barn apartments and piggery salon where my sister and I live, the guesthouse has its own private entrances and ample parking. We have three cats as well as ten hens who supply us with lots of eggs. Take a look at our gallery and you’ll get an good idea of French Farmhouse Style. Location. Camont is located just 15 minutes from Agen’s TGV train station and all the shopping and markets of this lively department seat. Bakeries, butcher shops, and other daily needs are just 3 minutes away in our neighboring villages. 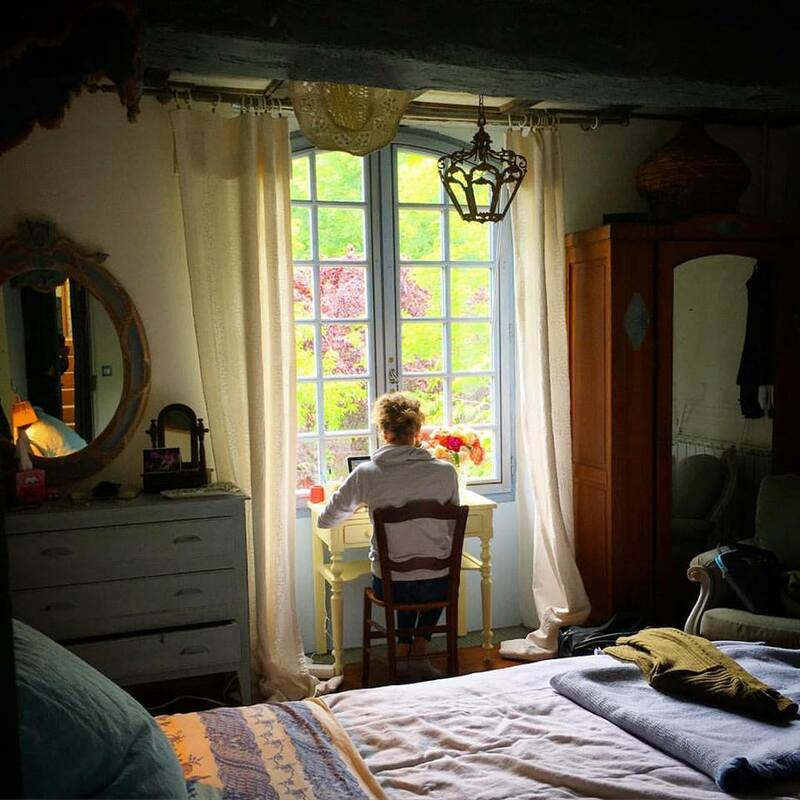 Beyond that is the sunflower carpeted countryside of Gascony dotted with medieval stone villages with lively weekly farmers markets, award-winning vineyards, and Armagnac cellars. Summer evenings are long and celebrated in festive village street fairs and open air markets while restaurants serve under tree sheltered courtyards. Placement. Camont sits on the Canal de Garonne and affords a chance to fish for small river fish, paddle along the canal in a kayak, or row a small boat for a quiet hour at sunset. The Voie Verte is a paved bike path that runs from Bordeaux to Marseille on the far bank of the canal while on Camont’s side there is a grassy tow path for strolling along. Generally a calm neighborhood with few houses along our country lane, we encourage choosing Camont as a quiet creative retreat rather than a party house. Two bedrooms- one on the second and third floors . We offer our guests quality linens, large bath towels, down pillows and anti-allergen pillows, hairdryers, natural French bathroom amenities, and international plug adapters. We often sleep with our windows open; there are no screens but we use electric mosquito repellent. Each room wooden floors, a desk, a ceiling fan, and an opening window. Bedroom #1 (200 sq.ft) : Queen bed (160cm), deep clawfoot bathtub and sink, and toilet en suite. Bedroom #2 (200 sq.ft) : Double bed (140 cm) and single bed (110 cm), shower, sink and toilet en-suite. Small laptop desk area with international plugs. Vintage serving dishes and cutlery, wine glasses, and barware. La Voie Verte is the canal-side bike path that runs just outside the garden gate. We can help you make arrangements for bike rentals in Agen- delivered to Camont. 250€ per night minimum 4 nights; 1500€ - 7 days. 50% deposit; full payment due 60 days in advance. When you stay at Camont, either my sister, Stephanie Hill, or I will be here to help you discover our wonderful region. There are house notes and annotated maps and we can give you day-by-day guidance as needed. While we welcome our guests warmly, we also cherish our private time and your privacy. I’m likely to be working on a writing project or off doing some research for future classes and culinary tours, but private cooking classes can be arranged in advance by special request. Just ask!